LOS ANGELES--(BUSINESS WIRE)--To celebrate the first day of fall, Halo Top Creamery is offering fans a chance to get their hands on the brand’s latest seasonal flavor, Pumpkin Pie, completely FREE. * For one day only, fans can simply print a free coupon at halotop.com/new starting at midnight on September 22. The printed coupon can then be redeemed at retailers nationwide on the same day wherever Halo Top® is available for a FREE pint while supplies last. While select fans can access a free pint on the first day of fall, everyone can enjoy the return of Halo Top® Pumpkin Pie from the beginning of September until the end of November. This fan-favorite pint is a pumpkin spice-infused flavor complete with pie crust pieces and can be found in retail stores nationwide, including Walmart, Kroger and Target. Named one of TIME Magazine’s “25 Best Inventions of 2017,” Halo Top® became America’s No. 1 pint of ice cream in 2017.2 Pumpkin Pie returns with Halo Top Creamery’s collection of 24 core flavors, including fan favorites like Peanut Butter Cup, Candy Bar and Sea Salt Caramel. Halo Top Creamery also has an extensive lineup of 14 core dairy-free and vegan pints, including popular flavors like Peanut Butter Cup, Candy Bar, Chocolate Chip Cookie Dough, Toasted Coconut and Vanilla Maple. 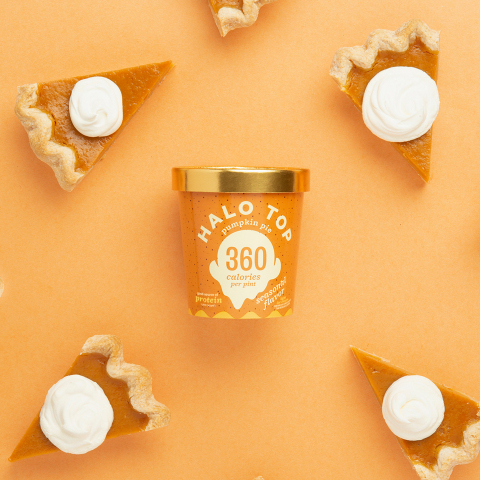 For a chance to say “Halo” again to Pumpkin Pie, fans can visit halotop.com/new and print the online coupon to redeem a free pint of Halo Top® at retailers nationwide on the first day of fall (September 22) while supplies last. Die-hard fans who can’t wait can head over to the freezer section of grocery retailers nationwide beginning in early September to purchase Pumpkin Pie or visit IceCreamSource.com for online purchases while supplies last. To learn more about Halo Top®, visit www.halotop.com or Facebook, Instagram or Twitter. Los Angeles-based Halo Top Creamery was founded in 2011 by former lawyer turned ice cream aficionado Justin Woolverton while he was on a quest to find an ice cream he could enjoy without all the guilt. Delivering premium ice cream people can actually feel good about eating, Halo Top® is crafted with only the finest ingredients. Halo Top® is available nationwide in the freezer aisle. For more information, please visit www.halotop.com or follow Halo Top® on Facebook, Instagram or Twitter. *Limit one pint per customer only while supplies last. Coupon is active and redeemable for one day only on September 22, 2018, from 12:01 a.m., EDT, to 11:59 p.m., EDT. To receive the pint, visit halotop.com/new on September 22 and follow the link to claim your coupon, which must be printed at home. Offer available to U.S. residents, except in the following states: CA, CO, KS, LA, NV, TN and WI. HALO TOP CREAMERY CELEBRATES THE RETURN OF ITS WILDLY POPULAR SEASONAL FLAVOR, PUMPKIN PIE, BY GIVING AMERICANS FREE PINTS ON THE FIRST DAY OF FALL.